Which basically says that you have to create a sparse disk image and put that on your external network drive and mount it. Notice that I chose 128 bit encryption for the sparse image. I add that to my network drive and mount it. That works great, when I open timemachine it is setup with that disk and I can perform backups. Normally if you can find the drive on the network through the TimeMachine UI, there is a checkbox to encrypt your backups. However when using tmutil on the command line I do not believe that there is an option for that. Is there a way I can get time machine to perform encrypted backups using this method? If not is there a way that I can mount this external network drive in such a way that the TimeMachine UI will be able to see it on the network so I can select it as a backup drive? 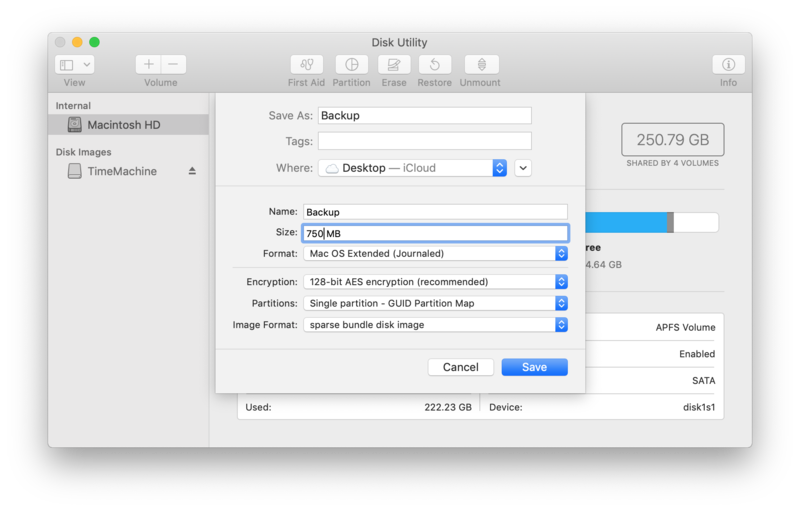 Browse other questions tagged macos network backup time-machine encryption . Encrypting/protecting Time Machine backup drive? Encrypt TimeMachine backups or rely on hardware encryption?